Whether you’re an independent consultant or part of a larger firm, there’s one skill that's critical for every consultant: communication skills. That's where tools like Power BI’s shared dashboards can help! Using shared dashboards to communicate updates can save time and money, keep stakeholders happy, and leave consultants to spend their time focusing on the more important (and interesting) parts of their work. In the Power BI service, dashboards can be shared for free with both internal and external audiences, which makes them well suited to the needs of consultants. 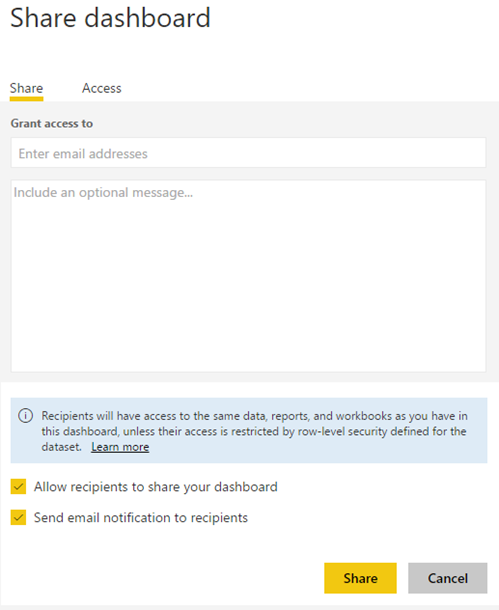 A dashboard link is emailed directly to recipients, who can then just log into their Power BI account to see what was shared. Shared dashboards are read-only, but can be cross filtered, sliced, and queried. Row-Level Security settings apply to shared dashboards as well, so consultants can be granular when deciding who gets to see what pieces of information. Sharing dashboards outside of your organization has a number of useful applications, no matter what kind of project you’re working on. For example, imagine that you’re a data analyst consultant who was contracted to create a dashboard that monitors online product sales for a local company. You would collect and analyze the data, create a report, publish key elements as a dashboard, and then share it with the Sales Manager who hired you for the project. The read-only status of the dashboard then ensures that you maintain control of your work. There’s no tampering with your data, no sharing beyond the originally defined scope, and the open possibility for more billable hours in the future in the form of updates. Consulting agencies can also benefit from shared dashboards. For example, sharing dashboards would be helpful as a marketing agency that has been contracted to manage a third party’s direct mail campaigns. As with the first example, you would collect and analyze data from the results of your campaigns, create a report, publish a dashboard, and then share it with the Director of Marketing for the firm that contracted you. This shared dashboard becomes an easy and quick way for all stakeholders, across organizations, to monitor the status and effectiveness of the campaigns. It helps foster a positive working relationship where no one feels left out of the loop, and provides a virtual “paper trail” for your data-driven marketing decisions. Consultants already have enough on their plate balancing the expectations of clients with the reality of project, but thanks to tools like Power BI’s shared dashboards it's easier than ever to share and sync real-time information on data analysis, status updates, and more, in a way that encourages finding insights while protecting your hard work. Do you have your own time-saving tips for analyst consultants? Share them in our Community! 1. Open the dashboard and select Share. 2. Select Invite, and type their email address(es) in the top box. Include a message if you like. You’ll see a warning for addresses outside of your organization, but you can still share with them as usual. Your recipient will get an email with a link to the dashboard. If they have not yet created a Power BI account, they will be prompted to do so after clicking the link. To see who has access to your dashboard, select Access.